Russia exported 11 Sukhoi SSJ100s worth $470 million last year. The Kremlin wants to explore the civil aviation market in the Middle East, but the toughening U.S. sanctions and rhetoric have diminished its chances in Iran, which many considered a big market for Russian products in light of the last year’s Joint Comprehensive Plan of Action (JCPOA), or so-called Iran nuclear deal. Signed in late 2015, the JCPOA came into force in January 2016. It represents a treaty between Iran and the five permanent members of the United Nations Security Council—the UK, the U.S., France, China and Russia—as well as Germany and the European Union. Moscow hoped that easing of the West’s stance toward Tehran would create a more favorable climate for trade and make it possible to place a worthwhile number of Sukhoi Superjet 100 (SSJ100) regional jets with local Iranian operators. Around the time of the JCPOA’s signing, Dmitry Rogozin, deputy chairman of the Russian government’s military industrial complex, forecast that Iranian airlines could take about 100 Superjets over the course of the next five years. Some would come from a local assembly line to be established under a special agreement between Tehran and Moscow. Two years later, his forecast looks like an unattainable dream. Even though the issue of SSJ100 sales has risen to the level of Presidents Putin and Rouhani, several barriers to such a deal exist. One centers on the need for Sukhoi to obtain permission to export the Superjet to “rogue states” from the Office of Foreign Assets Control (OFAC) of the U.S. Department of the Treasury. The latter administers and enforces economic and trade sanctions based on U.S. foreign policy and national security goals. According to the current regulations, an item made outside the U.S. that incorporates controlled U.S.-origin content exceeding the applicable “de minimis” percentage for a particular country stands subject to the Export Administration Regulations (EAR) as set by the the U.S. Department of Commerce. The “de minimis” percentage generally is 25 percent, but the percentage lowers to 10 percent when applied to what the U.S. deems “terrorist supporting countries,” such as Iran, North Korea, Sudan and Syria. The share of U.S.-made components in the SSJ100 totals some 13 percent. 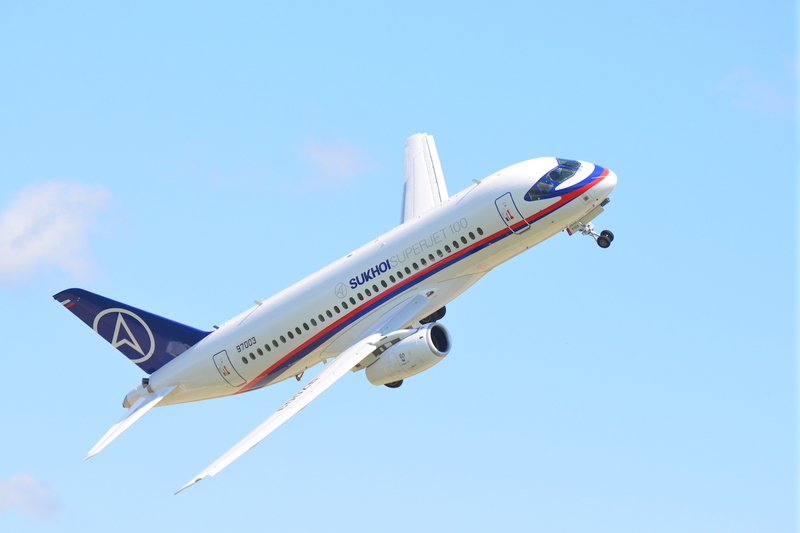 In October, Russian minister for industry and trade Denis Manturov said his country considered replacing U.S.-made components in the Superjet 100 (SSJ100) in an effort to render the aircraft EAR compliant. The minister acknowledged that replacing the U.S.-made parts would require a lengthy, consistent effort, adding that the process could threaten SSJ100 certificates granted earlier by EASA and other authorities. But Moscow will have to proceed in that way if the U.S. refuses the requested permission to export to Iran or simply does not answer, Manturov said. Earlier, United Aircraft president Yuri Slyusar addressed the same issue. “We filed the request with OFAC…but there is no exact time within which the U.S. side should reply," he said. UAC is not in a position to apply pressure on the U.S. side, and so it can only wait for a response. Meanwhile, Moscow and Tehran have agreed in principle on a deal covering an initial batch of 12 Superjets, according to Alexander Novak, minister for energy and co-chairman of the Iran-Russia intergovernmental commission. In addition to the U.S. parts, the Superjet’s large European content totals more than 60 percent of the aircraft’s value. Many items come from France, including avionics from Thales and engine cores from Safran. Some from the Kremlin’s elite, including Rogozin, have suggested reengining the Superjet with the Aviadvigatel PD-10, which uses the core from the larger PD-14 turbofan now undergoing trials for the Irkut MC-21 narrowody. But replacing the SSJ100’s SaM.146 is not an economically viable solution, according to United Engine Corporation general designer and deputy CEO Yuri Shmotin. The SaM.146 arose out of a joint development program between Powerjet partners Safran Aircraft Engines of France and Russia’s Saturn, which now operates as a member of United Engine Company (ODK). Shipments commenced in 2010 and flight operations the following year. As of October 2017, operational engines have logged more than 700,000 hours on-wing. Earlier this month PowerJet delivered the 300th engine to Sukhoi Civil Aircraft (SCAC). Headquartered in France, Powerjet carries responsibility for customer relations, including sales and aftersales support and services. It maintains spare parts distribution centers in Villaroche and Lytkarino. The idea of SSJ100 re-equipping gained momentum after the Russian government approved in late September a renewed civil aviation export strategy. Scheduled to run until 2025, the policy sets measures that the Kremlin would require of aircraft developers and manufacturers to promote high-tech exports. According to the document, last year the local industry exported 11 SSJ100s worth $470 million. Russia considers that level too low, hence the need for additional aid to local industry. The new program calls for allocation of 12.9 billion roubles for various measures of support in 2017-2022, chiefly for improving aftersales support of Russian-made aviation equipment. Separately, to promote sales worldwide, the program suggests establishing what it calls a specialized leasing platform. The body would act as a center of competence to render assistance including aftersales support and offer attractive operating and financial lease packages for to foreign airlines. The program also sets a target for sales, namely 215 SSJ100 and MC-21 jetliners worth $7.65 billion from 2018 to 2025. So far, the only significant Superjet sales outside of Russia has come from Interjet of Mexico. Sukhoi and its Italian partner, Superjet International, promise to deliver the eight remaining SSJ100s out of the Interjet order for 30 aircraft by year-end. UAC considers Iran a natural market for the Superjet, considering the large number of outdated and well-worn Fokker 100 jets that need replacing there. Because new Airbus jets and ATR 72 turboprops delivered to Iran Air since last year contain a number of U.S. components and use U.S. technologies, they stand subject of approval by OFAC. Both manufacturers acquired the required permissions, but the recent United Nations speech by President Trump and his address on the JCPOA give ample evidence of the changing attitude of the U.S. administration toward the regime in Tehran. Should the White House prohibit jetliner exports to Iran, the only viable options for the local carriers might involve taking used airplanes from the secondary market or buying new ones with no U.S. content from Russian and Chinese manufacturers.